There are three safari circuits in Tanzania and each one of them makes the country a top wildlife destination. One of the best safaris in all of Africa is definitely the famous Northern circuit with the Serengeti and Ngorongoro Crater, especially if you visit it during the annual wildebeest migration. 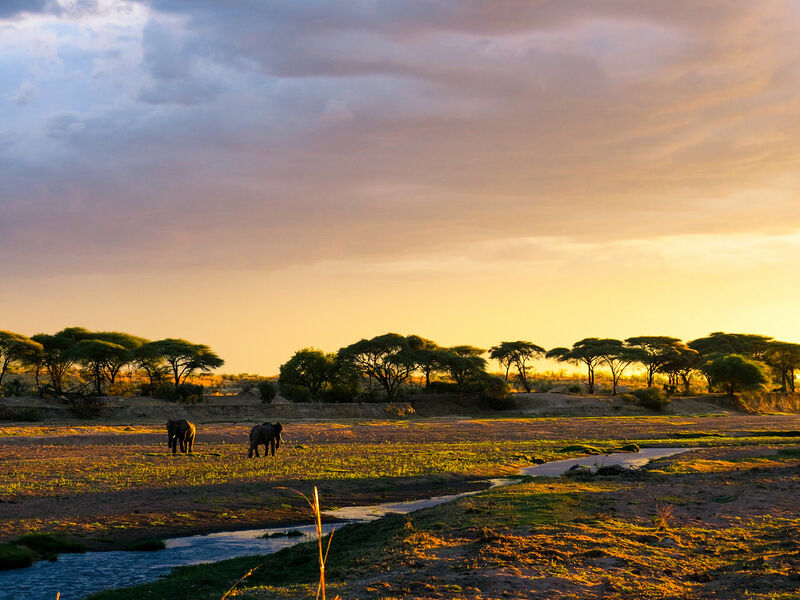 One of the most famous parks in Africa, Serengeti National Park is synonymous with classic African scenery and wildlife. It is a Unesco World Heritage Site and the oldest park in the country. Serengeti houses a spectacular wildebeest migration and premium wildlife viewing is possible throughout the year. The scenery in Serengeti is famous for its grassland plains in the southeast. The northern part has many hills and rocks, while to the west there are forests, valleys, and rivers. There are also koppies in several areas. Koppies are granite outcrops that rise up from the plains. The Serengeti is definitely the best park in Tanzania. The residents of the park at any time of the year are groups of elephants and giraffes, herds of buffalos, and many other hooves animals including Grant’s gazelles, kongonis, impalas, and topis. You will also have an opportunity to see all three big cats. Lions can be spotted practically everywhere, while cheetahs are quite common on the southeastern plains. Leopards can be seen along the Seronera River. The Serengeti is well-known for its annual wildebeest migration, a time when over 8 million hooves cross the open plains, as more than 200,000 zebra, 300,000 Thomson’s gazelle, and 1,500,000 wildebeest join the track. This migration is followed by plenty of predators and seeing big cats hunting is quite common and exciting. Black-backed jackal, spotted hyena, and golden-backed jackal can also be seen. Serengeti National Park is great for wildlife viewing all year long. However, certain areas are better at specific times. The Dry season runs from late June to October and offers the best wildlife viewing. During this time of year, the highlight of wildlife viewing is the wildebeest migration. Keep in mind that timing of this migration varies every year. The best chance to see it is in June and July, while the wildebeest calving takes place from Late January to February. The best time to see the wildebeest migration in the western corridor is in June and July, while the migration can be also seen in the north of the park in August. Animals gather around rivers and waterholes, which makes it easier to spot them. The vegetation is also less thick. There is little rain and plenty of sunshine. The chances of contracting malaria are minimal because there are very few mosquitos. The Seronera area attracts large crowds of tourists. Warm clothing is recommended for early morning game drives from June to August since mornings and nights are cold. An excellent time to see predator in action is from late January to February during the calving in the southern Serengeti. The low season is from April to May which means less tourists and low rates. It’s easier to spot wildlife in the Dry Season, but the best thing about Serengeti is that wildlife viewing is also amazing in the Wet season. Bird-watching is amazing thanks to the migratory birds. Except for March, April, and May, there is little rain and only short afternoon storms can mess with your tour. The peak of the Wet season is from March to May. The town of Arusha is the starting point of most safaris to Serengeti. The easiest way to get there is to fly to Kilimanjaro International Airport (JRO). This airport is located 46km/20 mi from Arusha. You can also fly to Julius Nyerere International Airport (DAR), which is close to Dar es Salaam and then use a domestic flight to reach Arusha Airport (ARK) or Kilimanjaro International Airport (JRO). The best way to reach Serengeti from Arusha is via a small plane to one of the many airstrips in the park. In case you are planning to drive from Arusha to Serengeti, expect to take an eight-hour ride as the distance between the two is 325km.202mi. Keep in mind that this is a bumpy ride over dirt roads for a large part of the trip. However, the scenery is beautiful and you will spot some wildlife on the way to Serengeti. Some tourists choose to fly one way and drive the other way to be able to visit the Ngorongoro Conservation area. They usually spend the night to visit the Ngorongoro Crater. The distance between the Seronera area and the Ngorongoro Crater is 140km/90mi and the ride is about three hours. To see which airlines can take you to Kilimanjaro International Airport (JRO) or Arusha Airport (ARK) please check Skyscanner. For multiple destination flights and to see how much you need to pay for the tickets check Expedia. In most cases, your tour operator will book the charter flights between the park as part of the tour package. Several local carries offer domestic flights. One of the best destinations in Africa for chimpanzee tracking is definitely the Gombe Stream. It was first researched back in the 60’s by Jane Goodall. It’s one of the longest-running studies of any wild animal population. A visit to this place is an adventure of a lifetime and an unforgettable experience. Gombe is located at the shore of Lake Tanganyika. The forest is divided by 13 streams that go all the way from the escarpment to the sandy beach. Looking back at the way that forested slopes climb up the steep escarpment is breathtaking. The population of the habituated chimpanzee is the main attraction here in Gombe Stream. Expect to find around 100 chimps in the small park. A guide is in charge of taking you on foot through the forest to find them. Once you spot chimpanzees, you can watch them for one hour. They can be feeding in the canopy which is a great sight. However, they tend to be on the move a lot and you and the guide will need to hurry up and follow them. Besides the chimps, other primates can often be spotted. Olive baboons are under study since 1960’s and you can see a troop of them here. Red-tailed and red colobus monkeys tend to stick to the forest canopy. The bushpig is also present. 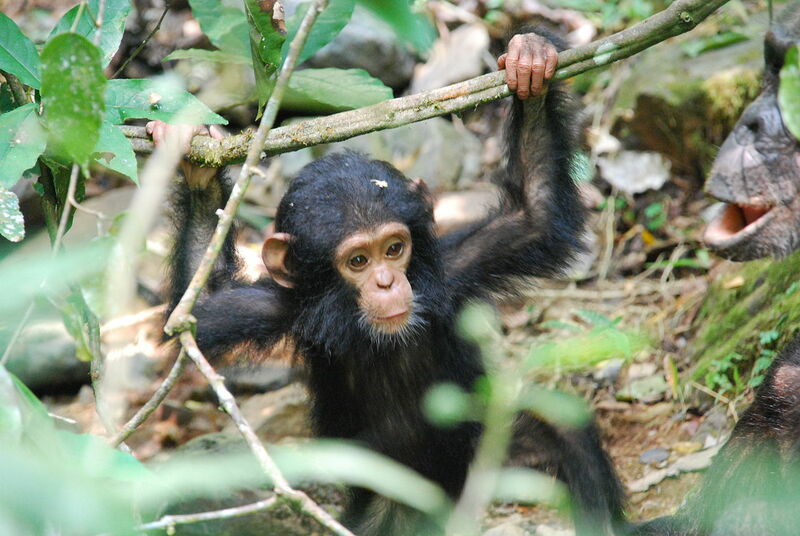 You can track chimpanzees throughout the year in Gombe National Park. However, the odds that you find them are better at the end of the Dry season from July to October. This is a period when chimpanzees prefer staying close to the lower slopes. In case you’re visiting in the Wet Season, expect to locate the chimps in three to four hours. The best time to track chimpanzees is from July to October then they stick to the lower slopes. There are fewer mosquitos and the risk of catching malaria is lowered. Although you might spot other visitors tracking chimps here and there, the park is rarely crowded. There is no haze and the air is clear. Bird-watching is great thanks to the presence of migratory birds. There are many butterflies flying around. The forest tracts are slippery to walk on. It may be difficult to track chimps, as they move away from the lake. It gets extremely humid and hot. Getting to Gombe National Park is not the easiest or cheapest. The only way you can get there is by taking a boat from Kigoma Town. Depending on the itinerary you choose, you can book an international flight to Kilimanjaro International Airport (JRO) in Arusha or to Julius Nyerere International Airport (DAR) in Dar es Salaam. Your tour operator is usually in charge of picking you up from the airport and arranging domestic flights to Kigoma Airport (TKQ). This person will also charter a private motorboat to take you to Gombe. The boat trip is not that long and takes less than an hour. Travelers can also wait for a public motorboat or as the locals call it “lake taxi from Kigoma to the park. This trip takes about four hours. To see which airline companies can take you to Kilimanjaro International Airport (JRO) or Julius Nyerere International Airport (DAR) please check Skyscanner. Travelers who are looking for multiple destinations flights and would like to know the price of the tickets can check Expedia for more information. In most cases, charter flights are booked by your tour operator as part of the package. Several local carriers offer domestic flights to Kigoma. 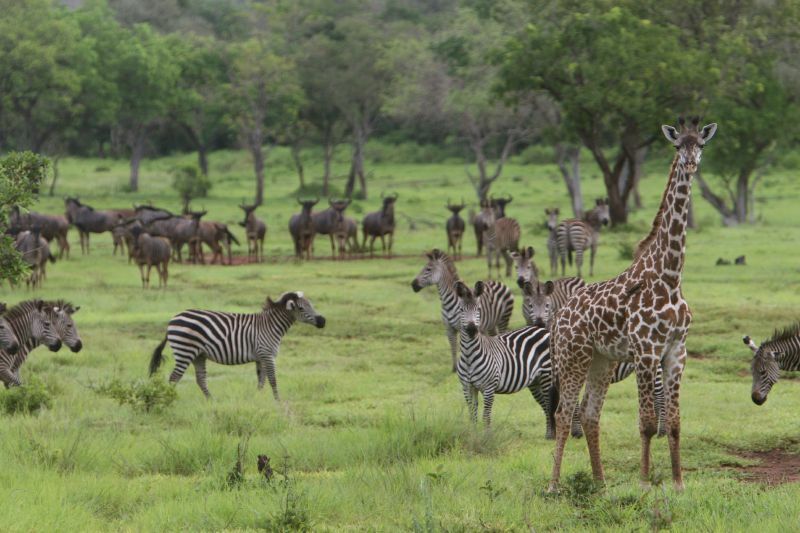 Tarangire National Park is a seasonal park located in northern Tanzania. It features a lot of migratory movement within the greater ecosystem in Tarangire. The Dry season runs between June and October and attracts large herds of wildlife to the Tarangire River. During this period, the number of elephants which can be spotted here is spectacular. The main feature in the park is the Tarangire River. The river can get very dry, but the park is thickly vegetated with mixed woodland and acacia shrubs. Expect to see plenty of big baobab trees. The south and east parts of the park boast a big seasonal swamp network, which is an important water catchment area. The Tarangire River attracts plenty of migratory animals in the Dry season including zebra, wildebeest, common eland, gazelle, hartebeest, elephant, and buffalo. Lions can also be spotted. Dry-country antelope can be spotted in Tarangire, such as the long-necked gerenuk and rare fringe-eared oryx. Interesting wildlife viewing opportunities including buffalo, elephants and Silale Swamp lion can be found in the swampy areas in the south of the park. Visitors will have a chance to see big pythons in the trees when the swamps start drying up. The best time to visit the park is from late June to October, which is the middle and end of the Dry season. Wildlife viewing is less good during the Wet season when most of the animals migrate out of the park. However, some of the elephants stay inside the park throughout the Wet season. It’s easier to spot wildlife because animals gather around waterholes and rivers and vegetation thins out. The risk of getting malaria is lower since there are fewer mosquitos. In the beginning or end of the Dry Season, the abundance of animals can vary greatly. This is dependent on the amount and timing of the rains. It is recommended to pack warm clothing from June to August since morning drives can get cold. This is the low season and raters may be lower. It is an ideal time for bird-watching and migratory birds can be seen. Wildlife is not as good as in the Dry season because most of the animals migrate out of the park. 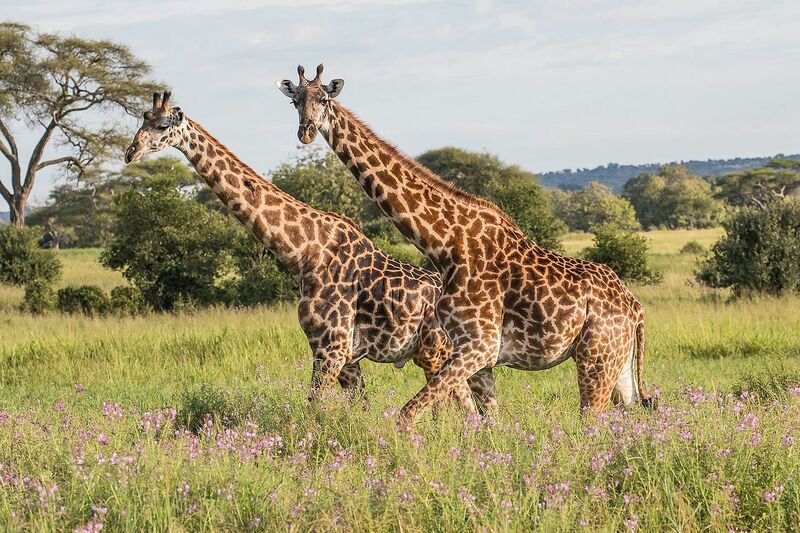 Tarangire National Park is a part of the popular northern safari circuit and most tourists are visiting this place as part of the safari tour package that also includes a visit to the Ngorongoro Crater and Serengeti. The starting point for most safaris to this circuit is the town of Arusha. The easiest and the best way to get there is to fly to Kilimanjaro International Airport (JRO). This airport is situated 46km/29mi from Arusha. You can take a flight to Julius Nyerere International Airport (DAR) near Dar es Salaam and then book a domestic flight to either Kilimanjaro International Airport (JRO) or Arusha Airport (ARK). Travelers who are searching for a cheap flight can fly to Nairobi in Kenya and take a bus that operates between Arusha and Nairobi. The pick-up is in the morning and you should arrive to Arusha around 4 PM. There are also regular flights from Serengeti and Arusha to Tarangire. It is a 2-hour drive from Arusha to the entrance gate of the park. It’s relatively easy to drive to Lake Manyara as the drive is two-hours long. The drive to the Ngorongoro crater which is 180km/110mi away lasts about four hours. To find out which airlines can take you to Kilimanjaro International Airport (JRO) or Arusha Airport (ARK) please check Skyscanner. For multiple destination flights and to see how much the tickets will cost you please check Expedia. In most cases, the tour operator is in charge of booking domestic and charter flights as part of the tour package. Several local carriers offer domestic flights. Katavi National Park is an off the beaten track Dry season park that offers great wildlife viewing. Four of the Big Five can be found at the park. Elephants, buffalos, and lions are present, while leopard sightings are rare. Only rhino is absent. The habitat here at the Katavi NP is grassland savannah and miombo woodland on the east side of the park. This place turns into shallow lakes and lush marshes after the rains. The Dry season attracts huge herds of zebra, buffalo, and impala that gather with Defassa waterbuck and elephant around the drying water reserves of Lake Chada and Lake Katavi. Crocodile and hippo can also be seen at this time. Lions are usually situated close to the water sources, just waiting for they prey. Katavi National Park isn’t that known for being home to unusual animals. However, thousands of buffalos can be spotted. You will also have a chance to see hippo and sable antelope that are usually nestled in the miombo woodland. The Dry season is definitely the best time to visit Katavi National Park. Unlike other parks that offer good wildlife viewing even in the Wet Season, Katavi is a classic dry-country reserve. The Wet season (November to April) is a time when wildlife disperses and wildlife viewing becomes difficult. The Katuma River gets reduced to a narrow stream after the rains and the floodplains become a magnet for a variety of animals. Animals are easier to spot since the vegetation is thin. There is little rain and the weather is usually sunny. There are fewer mosquitos and the risk of malaria is lowered. It doesn’t get extremely hot. It can be quite dry and dusty. Some lodges are closed in May. The scenery is quite lush. Better rates can be found from November to May also known as the low season. The conditions for bird-watching are ideal. Wildlife viewing becomes more difficult, as wildlife disperses into the woodland. There are many mosquitos and it can get extremely hot and humid. The easiest way to reach Katavi is by flight from Arusha. There are public scheduled flights operated by Safari Air Link between Mahale, Katavi, and Ruaha, but this service is only available twice a week. Nomad Safaris operates camps in Katavi and Mahale and runs a scheduled air service from Mahale and Katavi to Arusha via the airstrips in the northern parks. There are two entry points to the country. Kilimanjaro International Airport (JRO) is located about 46km/29mi from Arusha, while Julius Nyerere International Airport (DAR) is situated near Dar es Salaam. The tour operator is usually in charge of picking up guests from the airport and making further arrangements including a charter flight to the airstrip in the park. To find out which airlines can take you to Kilimanjaro International Airport (JRO) or Julius Nyerere International Airport (DAR), check out Skyscanner. For multiple destinations flights and ticket prices, please check Expedia. The tour operator is usually in charge of booking charter flights as part of the tour package. Flight tickets to Katavi can be booked with Safari Air Link. Ngorongoro Crater offers an experience of a lifetime. There is a chance that you will see all of the Big Five in just one day here and all this in a beautiful setting with a backdrop of the 600m/1,968ft-high crater wall. The Ngorongoro Conservation Area is remarkable in every way. Besides the famous Ngorongoro Crater, Olmoti and Empakaai craters are also scenic. 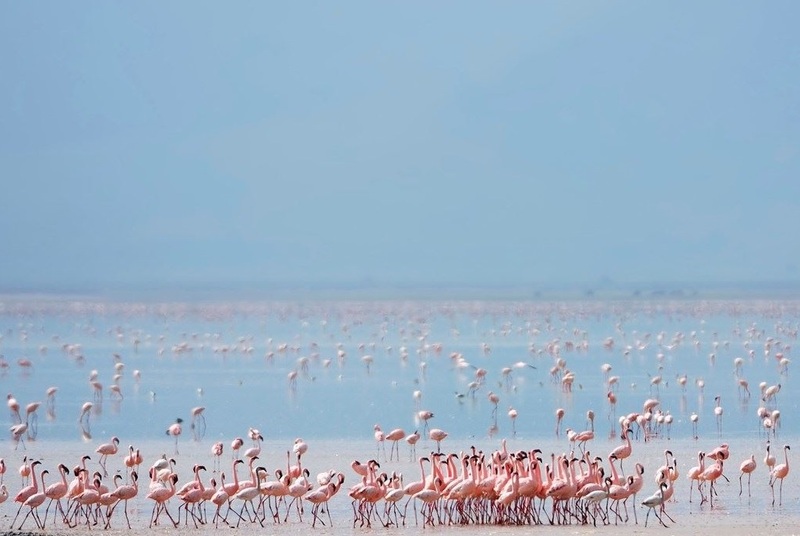 Flocks of flamingos can be spotted in both Empakaai and Ngorongoro crater. The forested crater rim here is in contrast with the crater floor. This crater field consists mostly of grassland. You will also have an opportunity to see the Lerai forest, which is an amazing yellow fever tree forest. The main attraction of the Conservation Area is the famous Ngorongoro Crater: a volcano that is extinct and often compared to the Garden of Eden. The crater offers great wildlife viewing and all major animals can be spotted. The giraffe is the only animal that is absent, but you can see it in the Conservation area. Elephants are common, as well as all big cats. The density of spotted hyena is quite amazing. One of the main features of the crater is the black rhino. Rhinos are not that easy to spot in Tanzania, especially because rhino is usually shy and sticks to thick vegetation. This is not the case in the crater, where black rhino has a predictable routine spending the day in the open grassland and the night in Lerai forest. Visitors will also have a chance to see a golden and black-backed jackal in the crater. 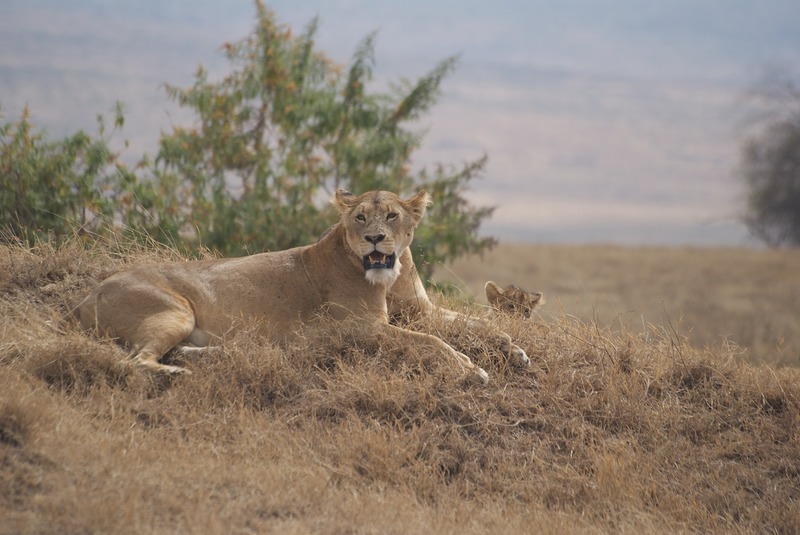 Ngorongoro Crater offers ideal wildlife viewing throughout the year. The best time for wildlife viewing here is in the Dry Season (June to September) simply because the grass on the crater floor is shorter during this time of year. Wet season months that last from November to May offer beautiful and lush scenery. The grass is shorter, so it’s easier to spot animals. There are fewer mosquitos and the chance of getting malaria is minimal. The Ngorongoro crater gets overcrowded with tourists. Bring warm clothing, as mornings and nights tend to be cold. Excellent wildlife viewing is possible in Ngorongoro Crater even in the Wet season. Better rates and fewer tourists can be found during the low season which occurs in April and May. Rains are mostly short afternoon storms at the beginning of the Wet season. Heavy rain can be expected in March, April, and May. The peak of the Wet season runs from March to May. Pack warm clothing, since its cold during the nights and mornings. The visit to the Ngorongoro Conservation Area is usually a part a bigger package, including a visit to the Serengeti. The conservation area is a three-hour ride from Arusha, which is the starting point of safaris in the northern part of the country. The easiest way to visit the parks of the northern circuit from Arusha is with scheduled and chartered flights. You can also drive in a safari vehicle and explore that whole circuit. One of the most popular options is to fly to Serengeti and go back by a safari vehicle via the Ngorongoro crater. The tour operator is usually in charge of picking you up from the airport. If you are coming from the Seronera area in the Serengeti, expect the driving time to the crater to be about three hours, as the distance is 140km/90mi. Wildlife viewing is possible along the way, but the ride takes much longer. The distance between Lake Manyara and the Ngorongoro Crater is 80km/50 mi and it will take you two hours by a vehicle to cover this distance. The drive from Tarangire takes about two hours. Flying to Kilimanjaro International Airport (JRO) is the best option to reach the town of Arusha. The airport is located 46km/29 mi from Arusha. You can also fly to Julius Nyerere International Airport (DAR), which is situated close to Dar es Salaam and fly to Arusha Airport (ARK) or Kilimanjaro International Airport (JRO). The last option is to book a cheap flight to Nairobi in Kenya and reach Arusha via a shuttle bus. To see which airlines can take you to Kilimanjaro International Airport (JRO) or Arusha Airport (ARK) check Skyscanner. Check Expedia for multiple destination flights and to find out how much money you will need to spend on the tickets. In most cases, the tour operator books the charter flights between the parks as a part of the safari tour. Several carriers offer domestic flights. Located at the base of the Rift Valley escarpment, Lake Manyara National Park is a small park with a groundwater forest that offers something different from other parks that are dominated by savannahs. The park is well-known for tree-climbing lions. However, these big cats are not seen that often. The main attraction at the Lake Manyara National Park is the elephants. This shallow lake is nestled at the base of the Western Rift Valley escarpment. There are different habitats in the park and all of them are scenic. After you’ve reached the park entrance, you will continue your journey through the amazing groundwater forest. Some of the other habitats here in Lake Manyara National Parl include acacia woodland, grassy floodplain, and rocky escarpment. All of the mentioned habitats can be covered in one day. The park is well-known for being home to plenty of wildlife including the main attractions like tucked elephants and tree-climbing lions. 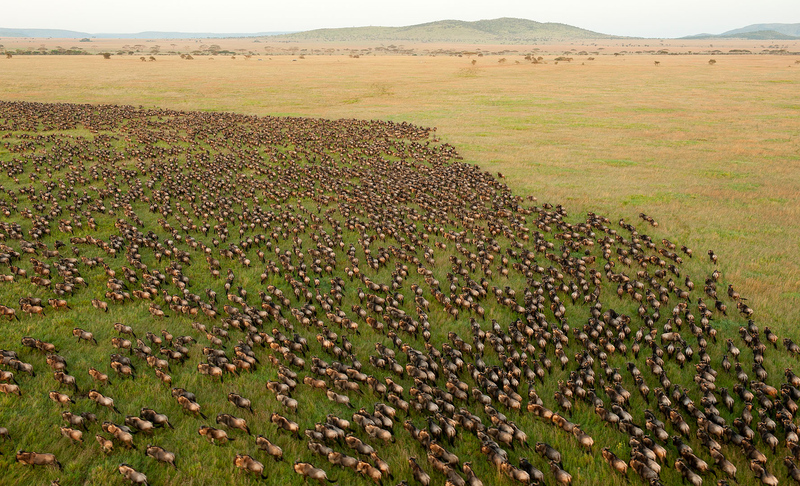 Grassy plains of the park attract large buffalos, zebra herds, and wildebeests. The best place to see these animals is the hippo pool. Travelers will have a chance to see large flocks of flamingos, as well as a variety of water birds. At the entrance of the park, there is a forest patch that houses troops of olive baboons and blue monkeys. Bushbuck can be also spotted here on rare occasions and pairs of klipspringer are visible on the rocks at the southern part of the park. Wildlife viewing in Lake Manyara National Park is good throughout the year. However, the best time for watching wildlife is during the Dry season from June to October. The Wet season which lasts from November to May also has its advantages. The waterfalls cascade down the escarpment and the vegetation is lush during this time of year. There are fewer mosquitos and less chance of getting malaria. Pack warm clothing for game drives in June and August, as it gets quite cold in the mornings. The scenery is quite lush and green. There are fewer visitors in April and May since it’s the low season. The rates are also lower. Although the best time for wildlife viewing is the Dry Season, Lake Manyara NP offers good wildlife viewing conditions all year long. There are migratory birds and this is the best time for bird-watching. Some roads become impassable because of the heavy rain. Lake Manyara NP is a part of the northern safari circuit. A number of safaris to this circuit start from Arusha. The easiest way to reach it is to fly to Kilimanjaro International Airport (JRO), which is located 46km from Arusha. You can also fly to Julius Nyerere International Airport (DAR) in Dar es Salaam and then take another flight to Arusha Airport (ARK) or Kilimanjaro International Airport (JRO) via domestic flights. You can also book a cheap flight to Nairobi in Kenya and then take a shuttle bus to Arusha. Your tour operator is usually in charge of picking you up from the airport in Tanzania. Travelers can also get to Manyara’s airstrip via flights from Serengeti and Arusha. However, the trip from Arusha only takes 90 minutes by car. Most visitors do the circuit in a safari vehicle, especially as the park is on the way to some other parks of the northern circuit including Serengeti and Ngorongoro. The driving time from Ngorongoro Crater and from Tarangire Np is in both cases about two hours. Travelers can check Skyscanner for airlines and ticket prices. You can also check Expedia for multiple destinations flights and to find out which airlines fly to Kilimanjaro International Airport (JRO) or Arusha Airport (ARK). Flights between parks are usually booked by the tour operator as part of the safari package. Domestic flights can be booked via local carries. Ruaha National Park offers amazing wildlife viewing and it is the largest national park in Tanzania. The park is ideal for spotting a number of predators including lions and endangered wild dogs. The Great Ruaha River is the main feature of the Ruaha National Park. This river attracts plenty of animals during the Dry season. Some areas are full of baobab trees and the dominant vegetation is miombo woodland. Aside from rhino, Ruaha National Park is home to all major safari animals which are present in good numbers. Lions are known to live in large groups and in order to feed themselves, they frequently attack other big animals like buffalos. A high diversity of antelope can be spotted including dozens of rare species such as roan, kudu, and sable antelope. Ruaha National Park seems to be a bit wilder than other pars in the area, but the real draw are the wild dog packs which you can spot regularly. The largest population of greater kudu in East Africa is located right here in Ruaha National Park. The best time for observing wildlife in Rhuna National Park is from the middle to the end of the Dry season, which lasts from June to October. During this time of year, the animals are easier to spot as they concentrate close to trusted water sources. Animals gather around waterholes and rivers which makes wildlife viewing easier. There are fewer mosquitos and the risk of getting malaria is at a minimum. Dryness and dust are quite common. Many lodges are closed in May. There are fewer tourists in April and May and the rates for accommodation and tours are better. It is an ideal time for bird-watching. Wildlife viewing is not at its best. The middle and the end of the Dry season offer better wildlife viewing. It can get extremely hot and damp. Many lodges and other types of accommodations are closed in April. Most safaris to Ruaha start from Dar es Salaam and the main point of entry to the country is Julius Nyerere International Airport (DAR). The tour operator is usually in charge of picking up visitors from the airport and taking care of all further domestic flights and transportations. The drive from Dar es Salaam to Ruaha takes around 10 hours. Keep in mind that the roads are quite dusty and bumpy. There are many travelers who make a stop at Mikumi NP during this drive. From Mikumi, you will need about five hours to reach Ruaha. The easiest and the best way to get to Ruaha is a scheduled or a chartered flight to the airstrip in the park. Unless you are planning to visit the park as a part of a southern circuit, all flights leave from Dar es Salaam. In case you are visiting the park as a part of a southern circuit, the flights depart from Mikumi and Selous. There are also flights from Arusha town and Coastal Aviation has direct flights between Ruaha NP and Serengeti. For flights and ticket prices please check Skyscaner. You can also check Expedia for multiple destinations and see which airlines can transport you to Julius Nyerere International Airport (DAR). Charter flights are usually booked by the tour operator as part of the tour package. Local carriers offer scheduled flights. One of the largest parks in Africa, Selous Game Reserve offers relatively small animal viewing since most of the park is set aside for hunting. However, amazing boat safaris and predator sightings can be found on the Rufiji River. The part of Selous that is located north of the Rufiji River is open to the public and can be described as scenic. There is the main wildlife circuit that follows five connected lakes which are fed by the Rufiji River. The Rufiji boasts swampy islets and palm-fringed channels. It is also one of the great rivers in all of Africa. In general, wildlife viewing in Selous is very good. You will find that the string of lakes along the main circuit is an ideal spot to spot a large group of giraffes, as well as other ungulates including zebras, impalas, waterbucks, and buffalos. Watch out for the hungry lions that can be seen close to the waterholes. Several antelope species can be found here in Selous including puku and majestic sable. Black rhino can only be spotted in some remote areas. wild dogs can be spotted in the park. The best time for wildlife viewing in Selous is from later June to October. This is the Dry season and it’s easier to spot animals as they gather around water sources. Vegetation is also thinner during this time of year. The Wet season runs from October to May and during this period the scenery is lush and green. Keep in mind that afternoons can be extremely hot in Wet season and many of the lodges are closed from March to May. It’s easier to spot animals since they gather around rivers and waterholes. There is also less vegetation. There is little rain and it’s usually sunny. It’s less risky to get malaria as there are not that many mosquitoes around. It’s not extremely hot and the humidity is lower. Drought and dust are quite common. Some areas of the park can get overcrowded with tourists. Expect to find beautiful and green scenery. There are fewer visitors from March to May and the prices for tourist attractions are lower. It’s the best time for bird-watching as migratory birds are present. It is more difficult to travel, due to muddy roads. Wildlife viewing is better during the middle and the end of the Dry Season. There are lodges that are closed from April to May. Humidity and heat are known to be overwhelming. A number of safaris to Selous are fly-in packages from Dar es Salaam. Julius Nyerere International Airport (DAR) is the main entry point to the country. It is located just outside Dar as Salaam. Your tour operator is usually in charge of picking you up and organizing further arrangements. Tourists usually visit Selous as part of their beach holiday on Zanzibar Island or as an extension of their visit to the beaches around Dar es Salaam. There are scheduled flights from these departure points to both Ruaha and Selous. Visitors can also fly from Arusha Town, which is the base for the northern safari circuit. Scheduled flights between Selous GR and Serengeti have just been recently introduced by the Coastal Aviation. This is an ideal route for travelers who don’t want to stop in Arusha, as it connects the northern and the southern circuits. You can also drive from Dar es Salaam to Selous on a road safari. However, the road is quite bumpy and the ride usually takes a full day. In some cases, to break up the trip visitors stop at Mikumi National Park. For airlines and ticket prices please check Skyscanner. For multiple destination flights visit Expedia to find out about flights to Julius Nyerere International Airport (DAR). Charter flights are usually booked by a tour operator as part of the safari tour package. There are also scheduled flights to Selous which can be booked with a domestic carrier. The information here is a general guide about malaria and vaccinations in Tanzania and you should consult your travel doctor before the trip. Travelers can find more information about traveler’s health on travel clinics and government organizations pages below. There is a high risk of malaria throughout Tanzania except in high altitude mountains like Mt. Kilimanjaro, Ngorongoro, Crater rim, and some parts of the Eastern Arc Mountains. Most safari parks in Tanzania are high-risk zones. The rainy season which lasts from November to May is the highest risk of transition. Detailed advice can be found on websites below. Recommended; see websites below for more detailed immunization advice. Tanzania offers amazing wildlife viewing. You will find three different safari circuits and each one offers something different. The Big Five are easily seen, as well as other high profile animals. The black rhino is quite rare, but there is a chance you will spot it at the Ngorongoro Crater. One of the best wildlife spectacles in Africa is the wildebeest migration. There are around two million ungulates mainly wildebeest, but you will also find zebra and gazelle moving around the Mara-Serengeti ecosystem. A special time to visit is also the wildebeest calving season. Plenty of wildebeest and their calves attract a number of predators, which makes it an ideal time to see some action. The abundance of big cats can be found in Serengeti, while the endangered African Wild Dog can be easily spotted in Ruaha and Selous. The two best chimpanzee reserves are Mahale and Gombe Steam. Good wildlife viewing in Tanzania can be found year-round. 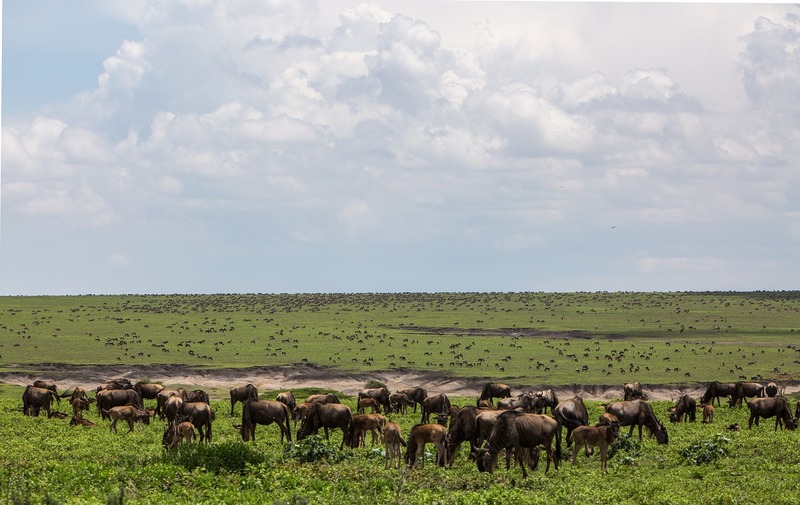 The wildebeest migration runs from June to July, while the best time to spot the wildebeest calving in the Serengeti is from late January to February. The Dry season which lasts from late June to October is the best time for wildlife viewing. During this time of year in Tanzania, the weather is great and animals gather around waterholes. The Wet season runs from November to May and offers green parks and fewer tourists. Southern and Western circuit parks are not easy to access from March to May because of the rain and some lodges are closed during this period. The Dry season that lasts from late June to October is the best time for wildlife viewing in Tanzania. You will have an opportunity to see the wildebeest migration in the Serengeti in June and July. The best time to see the wildebeest calving is from late January to February. The Dry season is the ideal time to visit the southern and western circuit parks, while northern circuit parks can be visited year-round. The only exception is Tarangire where wildlife viewing is better during the Dry season. It’s easier to spot the animals since most of them gather around rivers and waterholes and there is less vegetation. The weather is sunny and the skies are clear. There are also fewer mosquitoes simply because there is little rain. Although many travelers like visiting circuits during the Dry season, the parks are not that crowded. The only exception is the Seronera area in the Serengeti and the Ngorongoro Crater. Mornings and nights are usually colder and you should pack warm clothing for morning drives, especially in June, July, and August. The best time to spot the calving in action in the southern Serengeti is from late January to February. Expect to find green and beautiful scenery. Low seasons means less crowded parks and lower rates. Although it is easier to spot wildlife during the Dry season, tourists will have an opportunity to spot wildlife in northern circuit parks. Except for March, April, and May, the Wet season mostly brings afternoon showers. Wildlife viewing in Ruaha, Katavi, Selous is better during the dry season, as most big wildlife has already migrated to Tarangire NP. Dar-es-Salaam, Kilimanjaro (near Arusha) can be reached via direct and one stop flights from overseas. The starting point for the popular Northern Safari Circuit in Tanzania is Arusha Town, which is located 46km/29mi east of Kilimanjaro International Airport (JRO). The main airport in Tanzania, Julius Nyerere International Airport (DAR) is located 13km/8mi from Dar-es-Salaam. It is also the entry-point to travelers who are visiting the southern parks in Tanzania. You can fly or drive between the reserves of Dar-es-Salaam. Some flights out of Arusha depart from Kilimanjaro International Airport. However, most flights to the reserves leave from the small Arusha Airport (ARK) which is located 8km/5mi west of the city. In most cases, the tour operator is in charge of picking travelers up from the airport and arranging all other transportation as a part of the agreed safari package. For flights please check Skyscanner. For multiple destination flights check Expedia and see which airlines fly to Tanzania and at what price. Both charter and domestic flights are usually booked by your tour operator as part of the safari package. You can also book domestic flights with a few domestic carriers.